I am very proud to be a part of 100 Stories for Queensland. In January 2011, people around the world watched in horror as the worst floods in generations swept through Queensland – destroying homes and livelihoods and taking lives. I sat in a hotel in the USA, tears streaming down my face as I watched places I knew and loved wash away. My family and friends were all safe, but some of what was lost was a part of my past. I felt the loss more keenly because I was so far away. I wanted to do something to help – and a few days later was alerted to the 100 Stories for Queensland project. The call went out for writers to donate short stories to create a book – all the profits from which would go to aid flood victims. Within just 16 days, an amazing 300 stories had been offered from writers all over the world. I was honoured when I was told that my story – On the Road East – would be included. A dedicated team of volunteer readers and editors then went to work to produce the finished book. This is not a book about the floods. This is not a collection of real-life stories. This is fiction – uplifting and intriguing stories. They will make you laugh. They may make you cry. And the money raised will help the people of Queensland rebuild what has been lost. Not only that, this project has brought together a diverse group of people from all over the world – with a desire to help those who needed it. That’s got to give us all hope. If you’re looking for some good reading, coupled with the knowledge that you are doing a good thing for others – please go buy the book. You won’t be disappointed. 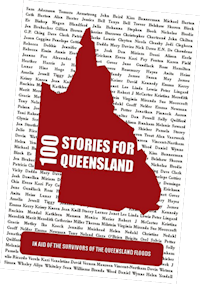 Order 100 Stories For Queensland as an ebook from the publisher.